What will be the sports games of the future? We’ve seen glimpses of what could be in countless movies and games (Blitzball anyone? ), but rarely do they succeed at capturing the imagination of the public at large. 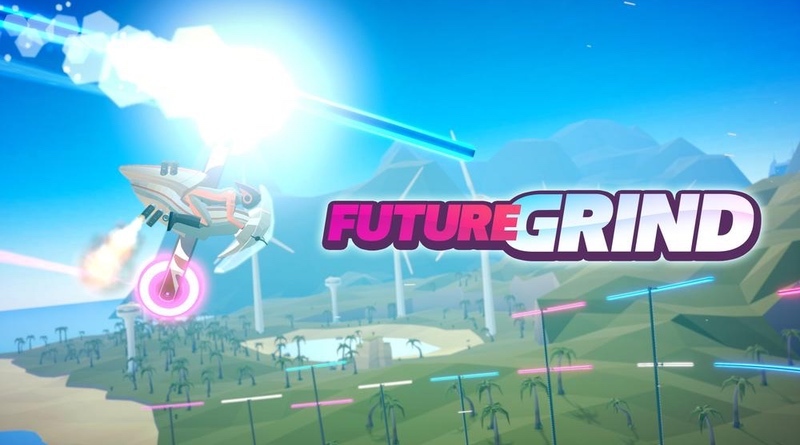 Milkbag Games has decided to throw their hat in the ring with FutureGrind, a unique and somewhat addictive racing game that with a deceptively easy concept. While the simplicity of the name matches the overall gameplay, there’s a bit more creativity at work here than meets the eye. The goal of FutureGrind is to reach the end of a course by grinding on rails and occasionally completing other side objectives. You ride a futuristic bike that you must balance between its upper and lower wheels. There’s a variety of different bikes to unlock as you progress through the game, and each bike has its own unique build that makes playing each of them feel very different. While the controls are as simple as tilting the joystick to rotate left and right, mastering your bike’s movement will prove to be all the more challenging. Despite the basic controls, the game does a fantastic job at adding new challenges to the gameplay while still keeping it easy to understand. For example, both of your tires will turn different colors, and you must grind on the rail with the corresponding color or else you’ll blow up. Some courses will be made more difficult by having one of the tires of your bike extended farther out than the other, making maneuvering around the track a lot trickier. These slight tweaks in level design and rules make for a fun experience throughout. The tracks all remain very bare bones and in fact they are all straightforward paths that lead to a goal, with the only real difference being the placement of the rails you grind on. While the different rules and bike variations help make each track feel like its own course, some of them also feature an interesting background that helps separate them from looking too similar. Adding to the formula is the fantastic techno soundtrack provided for each level, which really gets you sucked into each track. Despite such amazing potential in the gameplay, the game never seems to push the envelope. FutureGrind has a rather short story mode with a very lackluster story. Besides Time Attack, there are no other modes to mess around with. No track customization, no challenge mode, no tournament mode, nothing. The story section is very fun to play and entertaining (despite the actual story being useless), but it’s very short and ends before you know it. Speaking of which, this game never does anything interesting with the fact that it’s supposed to be a futuristic sport. All you do is race down tracks by yourself to try and score points and reach the goal alive. It almost feels more like a talent competition because you have no other racers to contend with. It would have been really cool to race on a never-ending track with other opponents to try and be the last racer remaining. That could have made for a fun competition mode, which would have also opened up opportunities for various multiplayer modes. Sadly, this hurts the replayability of the game in a very harsh way. While the tracks are fun and fresh the first time around, soon playing the same tracks over and over again is going to get tiring. With no other modes to offer any new challenges, you’ll be burned out on this game soon after your first playthrough. As a first time experience, it’s fantastic, but replayability doesn’t seem to have been on the minds of the developers. With no news or future updates or DLC, it would seem like there’s no excuse for the lackluster amount of content in FutureGrind, especially since it’s selling for $19.99. FutureGrind has a fair amount of effort in some places but comes up short in others. The gameplay is simple yet creative, the tracks are challenging, and the backgrounds and music really draw you into the game’s world. On the other hand, there’s a severe lack of content and the game never goes far enough with its premise.